Installing baseboard vents doesn't have to be a hassle especially with this 18" triangular return grill that is screw mounted into your floor. Our return air grill features a classic sunburst design. The baseboard vents are coated in a white enamel finish to help protect and prevent your vent from scratching. This return air grill is perfect for all of your cold air return needs. For durability, these baseboard vents are made out of all stamped steel and ship straight to your home. Update your return air grilles today and replace old outdated vents. These baseboard vents work well with most forced air systems and are an inexpensive solution to covering up any duct work. The 18" return air grill is triangular in fashion and has a hole opening underneath that measures approximately 12" long. Browse our full line of triangular baseboard return air grilles with options in different lengths and depths. We also have baseboard vents available that will open and close with its adjustable damper for your heating and cooling needs. 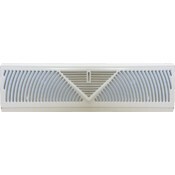 Use this return air grill in your home or office today and get your baseboard vents shipped straight to your door.